Ok, somebody has to do it. After all those card images you have seen so far with girls, girls, and more girls, I will be the one to present to you that lone card in This Side of Paradise that does not sport some eye-candy in the form of, er, a fascinating She from the Star Trek galaxies. The other Side of Paradise, if you will. As you might have guessed, it is a mission, and it's not even one taken from a good episode. In fact, Angel One is widely considered to be one of the worst episodes of The Next Generation, but, in keeping with the overall theme of the expansion, it is one that has quite a few ladies in it. Powerful ladies. Ladies so powerful that they decided that it is better to look at men as a more or less inferior, but necessary part of their society. Your task, should you accept orders to complete this mission, is to Track Survivors of a stranded ship there. You can either do this the high-tech way, relying on the skills of Engineer, Geology, Science and Transporters, or you can try to talk to the Angels. A healthy dose of "people" skills (Diplomacy, Honor, Law, Leadership) will do, using Integrity as the requisite attribute. At 35 points, the attribute requirements of >32 or >30 for Cunning or Integrity, respectively, already sound like a good deal to me. With one Integrity less for the same number of points, Track Survivors even beats the immensely-popular, Integrity-based planet missions The Last Outpost and Transport Delegations. Compared to them, both ways of completing Track Survivors ask for one of the rarer skills (Transporters or Law), but to make up for that, you won't have to cough up a double dose of Diplomacy or Treachery. But the fun doesn't stop here. Remember why the ladies of Angel One insisted on treating males like second-class citizens and kept on discriminating against them? Neither did I, but I looked it up, and apparently it was because they thought that men might become "too powerful" one day if given equal rights, and feared that their cozy little matriarchy would deteriorate into a planet full of barbecues, deer hunting and baseball. 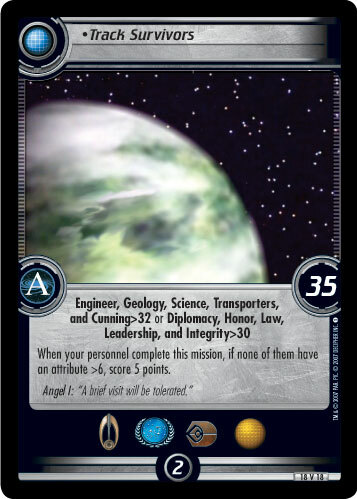 So, as a little incentive to protect Angel One's 'girl power' government, the designers of This Side of Paradise decided to give away five extra points for a player who uses only personnel who are not "too powerful" to complete it â€“ in game terms, this translates to personnel who do not have an attribute greater than six. That means that in order to score a whopping 40 points for an Integrity >30 mission, all you have to do is complete it with a bunch of your average weenies. Of course, this means that if you want to get those five extra points, you will have to have at least six personnel to complete the mission, but that should not be too much of a problem. Stocking some copies of Bhavani, who happens to have all the necessary skills and the maximum Integrity of six (for the extra points), any non-Borg affiliation can use this mission. For Bajorans, the latest version of Kira Nerys (Lela) and Varis Sul (Tetrarch of the Paqu) also have the full package, while at the same time staying under the "too powerful" limit. Shakaar Edon (First Minister of Bajor) is similarly good for Bajorans (did I mention he can be played for free after you have completed Investigate Maquis Activity? ), and Solbor (Faithful Attendant) coupled with one of the numerous Kais or Vedeks can even make sure you get 40 points out of this mission even with a "too powerful" mission team. Lastly, Track Survivors might also lend itself well to Klingon Diplomacy decks. Throw in some Non-Aligned personnel, and Gorkon (Visionary Chancellor) with his daugther Azetbur will Track those Survivors faster than you can say "forty frickin' extra points".